With today's announcement of the 2016 Daytime Emmy Award nominations, a select group of Hollywood hotshots inched that much closer to fulfilling their EGOT dreams. The EGOT, of course, stands for Emmy, Grammy, Oscar, Tony, and winning the four required awards is so difficult that, to date, only 12 people are members of this increasingly discussed and completely unofficial club. Or is it 10? Two EGOTers, Whoopi Goldberg and Frozen composer Robert Lopez, sealed the deal via Daytime Emmys instead of the more prestigious ones handed out for primetime fodder. Whoopi herself even joked about it in a cameo on 30 Rock, after Tracy Morgan's EGOT-obsessed Tracy Jordan essentially gives her achievement an asterisk because of the lesser Emmy. "Still counts!" quips Goldberg. "Girl's gotta eat!" But it's worth discussing: should a Daytime Emmy count toward an EGOT? Or does a true EGOT require a Primetime Emmy? To find out, we knew we had to take our questions straight to the source of all things EGOT: Philip Michael Thomas, the former co-star of the 1984-1990 primetime series Miami Vice, who coined the term as a mantra meaning "Energy, Growth, Opportunity, and Talent" but acknowledged its double meaning as far back as a 1985 People profile. 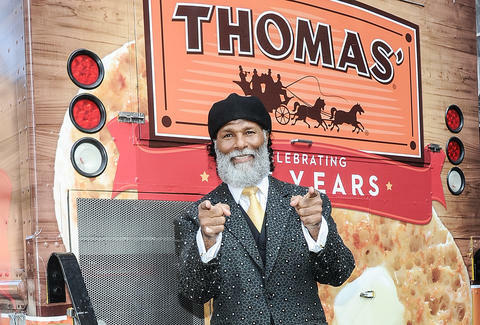 Luckily, Thrillist attended an event commemorating the 135th anniversary of Thomas' English Muffins, where PMT and other notable Thomases had gathered for a free breakfast, and he finally cleared up this vexing EGOT controversy. Or at least we think he did. When Should You Bail on a TV Show? Here's our burning question: does a Daytime Emmy count toward an EGOT? Whoopi Goldberg is a known EGOT winner, but she won with a Daytime Emmy. Is that legit? No? It's got to be a Primetime Emmy? No, no, whatever. You can win all four of those awards -- however you get it. But it's not really about the awards. If you study to be a doctor, you want a degree, right? Okay. If you're studying to be a lawyer, you want a degree. In the entertainment business, it's about accomplishing your goals and finally winning at your craft. If you're starring on Broadway, you want to win a Tony. You star on television, you want to win an Emmy. You starring on film? Oscar. Okay? Same thing. So should there be a new phrase for people who've completed an EGOT via a Daytime Emmy? The DEGOT? You got to remember, this is 30 years ago. And when I coined the phrase, it had nothing to do with being limited. So if somebody else wanted to have a DEGOT, they could. They could have a ZEGOT. You could have the Zest Awards. A-ha, so it's fine for someone with a Daytime Emmy but not a Primetime Emmy to say, "I won an EGOT," because they do have an Emmy of some sort. I have no jurisdiction over any of that. I know, but just in good fun. No, I have no jurisdiction over that. But as the person who coined the phrase, your word carries a little weight. So if you say that a Daytime Emmy counts for an EGOT, it would. Would it count for you? Okay -- it's still an Emmy. Yeah. [Pinching my dimple] You're too cute. Have you won any of those awards? 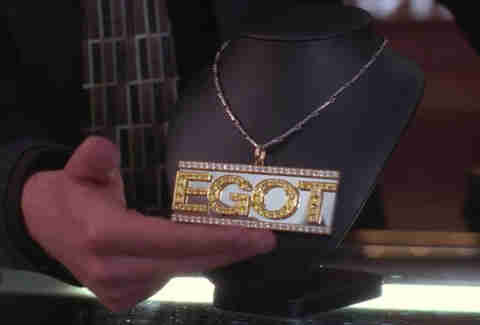 Has it surprised you to see the term "EGOT" become so commonplace? Do you know Miami Vice? Okay. Do you know Broadway? Okay, you give me a sport. What about it? Are we just naming sports? What about it? There's things so much more fascinating than this, what you're talking about. Are you surprised that the EGOT is part of your legacy? My legacy is being right here with Thomas' English Muffins, celebrating the 135-year anniversary of this fabulous name that I was born with. And I've been in the entertainment business professionally since 1968, and I'm not going to retire. So I don't know what tomorrow brings. But it's a continuum. Jenna Marotta is a contributing writer for Thrillist Entertainment and her EGOT-obsessed editor John Sellers thinks she should win an EGOT just for this interview alone.